First impressions are that these guns should change some want lists -- even for people who are focused on German/English guns. It's smooth, quiet, and easy to hit with, but for some reason the artillery hold doesn't work for me -- holding it pretty tight to get good groups with 10.5 CPs. I'm amazed by how well behaved this very light "plastic" gun is shooting with the ram. I installed the GRT-III before it was an hour old and that completes the package (Better scope someday. Factory scope is OK). No pretty wood or deep, mirror-finished bluing ... durability remains to be seen ... but otherwise I put it right up there with my R7 and TX200 MkIII in the firing sweetness department. ... Ragged hole at 10 meters. When the world thaws out I'll try longer. ... Almost as quiet as my shrouded TX200 and similarly smooth firing cycle. ... Haven't chronoed yet, but looks like 16-19 FP by Tom Gaylord's Pyramyd tests. My informal phone book quickie agrees. ... (Way less $$ than a TX). ... It's plastic all-over. There's so much plastic that you don't feel cheated by any plastic parts, because ... the whole danged thing is plastic. Once you install one of those pretty gold-anodized GRT-III trigger blades, you'll focus on that little piece of bling and forget all the plastic (opposite effect of finding a plastic shortcut on a nicer gun). Go shoot it: all is forgiven. Although I am fond of the R-9's that I do most of my small game hunting with, I have to admit that I found much to like about the .177 Gamo Shadow during the years that I owned one. We still have one in our household, but it is my wife's gun. I believe that the subject of whether the R-9 or Shadow is more accurate is open for debate. My Shadow certainly never gave cause to complain in the accuracy department, and my wife's has been a little tighter grouping than mine was from day one. My off hand scores with her Shadow aren't much different than what I get with my .177 R-9 out to about 40 yards or so. One thing that most people who have shot both rifles extensively will stipulate is that the R-9 is easier to shoot accurately, due in part to its slightly heavier weight, and in large measure to its vastly more refined trigger feel. Well, there is no need to ask "what if" because there is a solution, and it more than lives up to the press that hundreds of satisfied customers have already given it. That solution is a "drop-in" replacement trigger blade marketed by Bob Werner, aka "CharlieDaTuna," the man behind Charlie's Springer Works. In my view, the GRT trigger was one of the best products to hit the adult airgun scene since the introduction of the R-1. Mr. Werner could have left things well enough alone, but my understanding is that the new GRT-III version will be an even further refinement, one that will accommodate manufacturing tolerances from gun to gun better in the broad spectrum of rifles that it is intended to function in. My wife's Shadow served as the test bed. Her rifle is slightly over two years old now, and has in excess of 7,000 shots through it's bore. Over time, much of the "loose gravel" feel wore itself out of her trigger (thanks to use and re-assembly with moly paste). The heavy pull weight (compared to a factory-adjusted Rekord) and unpredictable let-off, however, remained. Prior to installing Mr. Werner's trigger blade, I measured the pull weight of the Shadow at the advertised 4.25 pounds, using an RCBS trigger pull gauge. My trigger blade came in a heavily padded shipping envelope, along with a hex key for fine tuning and VERY DETAILED, yet easily understood instructions. The hardest part of the installation was breaking the "LocTite" that I had applied to the action screws of the Shadow before shooting it for the first time. Once that was accomplished, it was a simple and very quick case of "out with the old, in with the new." The trigger blade is held into the housing by a large pivot pin which is retained on either side of the housing by a clip. I removed the clip from the right-hand side of the housing (facing the breech) opposite the anti-beartrap mechanism, and drove the pin out. Once the pin is removed, the stock trigger blade can be slipped out of the housing. In it, there is another pin that transfers to the new GTX/GRT trigger, with the same orientation. The next step is to remove the factory adjustment screw that remains in the trigger housing when the stock blade is removed. Once that is accomplished, you slip the new GTX/GRT in the housing, re-install the trigger pivot pin, and replace the clip that secures it. Next, you place the barreled action back in the stock, tighten down the stock attachment screws, and you're done! It will take you nearly as long to read this paragraph as it does to do the actual work. With the new trigger blade installed, the difference in feel is so dramatic that it is very difficult to comprehend how something so simple to do could yield such a big result. As issued, the Gamo trigger isn't a true two-stage unit. It is a single-stage trigger made to feel like a two-stage unit with a relatively heavy trigger return spring. With the GTX/GRT installed, the trigger functions as a true two-stage unit should, with each stage of the pull doing actual work. Sear engagement remains more than adequate to retain the piston when the rifle is cocked. When pulling on the new trigger, you pull through a functional first stage to a discernable "bump" where the second stage begins. The slight application of a miniscule amount of additional pressure then trips the sear and allows the rifle to discharge. How slight' Try 1.18 lbs. That's the figure that my trigger pull gauge gave EVERY TIME I measured it. Admittedly, though, I was pretty satisfied with measuring it three times in a row and calling it quits. As it is, my wife's trigger requires .78 lb less force to discharge than my R-1 and R-9's do, as all of them are adjusted for a two pound pull. The pull is very light and the let-off is now totally predictable, with the overall feel being very refined and smooth. There is some overtravel, but it is not objectionable. As indicated in the instructions, the trigger came pre-adjusted to a very acceptable feel, and I see no reason to mess with it beyond "just because I can" for the sake of experimenting. Rather well. I'm in a pretty good position to tell, since I've got a pair of R-9's and a fairly new R-1 to compare it with. How well depends on the individual guns in question and on the shooter's ability to perceive minute differences in feel. Some will notice a slight difference, but personally, I don't think many recreational shooters would. I still prefer the trigger on my .20 R-9 over this modified unit in my wife's Shadow, but I DO NOT prefer it enough to make the difference that's there worth dealing with the R-Series Beeman safety, which is located in a silly spot and requires a re-cocking motion to reset. The modified trigger on the Shadow feels so substantively similar to the trigger on my .177 R-9 that I am willing to call it a draw, while it feels BETTER and MORE REFINED than the trigger on my new and hardly used (less than a tin of pellets) .20 R-1. That is why I can make the "depends" comment in the paragraph above. Bear in mind that "feel" is a subjective thing. That said, if you put ten shooters on a trigger that I think is a good one, it's probably safe to say that 8 or 9 of them will feel the same way I do about the trigger's goodness. I've posted this here, rather than in the Gamo forum, in the hopes that those who don't yet have any pre-conceived bias or brand loyalty might be more inclined to read this before deciding to throw down on an R-9 or something else. If you like the look of synthetic-stocked rifles (as many younger shooters and less tradition-bound folks than myself do) or find practical advantage in a synthetic stock, then a Shadow, properly scoped, with a GRT trigger, might actually meet your needs and wants better than anything else out there. If you already own a Gamo, YOU NEED THIS TRIGGER BLADE! Without this trigger blade on the market, there may indeed be much better rifles to spend one's money on, but with this trigger blade on the market, I can say that for the hunting that I do, a Gamo (particularly the Shadow) so equipped would be pretty tough to beat. I am so impressed with this product that I will be buying another Shadow in the near future and putting in an order for the new GRT-III trigger blade to compliment it. In this case, "impressed" is an understatement! I'm so enthused about this product that I added a page about it on uplandhunter.net that I'll probably keep up indefinitely. To view it, go to the scroll down to the updates listed in red at the bottom of the homepage for uplandhunter.net, and click on the link you'll see at the bottom. CharlieDaTuna GTX/GRT trigger in Gamo CFX -- Wow! I am an unabashed fan of the Gamo CFX underlever air rifle. I think it hits a real sweet spot in the price/performance curve where a lot of performance intersects a fairly modest investment. But if there is an area in which the CFX does not shine, it's the trigger. I don't think it is as loathsomely bad as some folks have made out, but it certainly could use some improvement. It's not as smooth as most shooters would like and it certainly pulls harder (4.5 pounds or more, depending on the gun) than I would like. Nevertheless, I have been able to achieve some very satisfactory accuracy with the box-stock CFX. Today, however, I installed the GTX trigger that was developed by CharlieDaTuna -- https://www.charliedatuna.com/ -- and Steve from NC. The installation took about 15 minutes and is accomplished with ordinary hand tools (a couple of screwdrivers, and a tooth pick for dabbing on some lubrication). The only other thing that is needed is some moly paste or, failing that, some 30-weight non-detergent motor oil. Once you remove the old stamped and folded sheet metal trigger and other unnecessary parts, the precision-machined, gold (color) anodized trigger simply drops into place. You replace two pins, a clip, and slip the action back into the stock, and you're done. Trust me on this: if I can do it, the odds are overwhelmingly in your favor that you can do it. The result, though, is an absolute transformation to the CFX trigger. The new trigger is very smooth. There is an extremely light first stage, followed by a very light second stage. Charlie says that most of his guns come out at 1.5 pounds pull, but I suspect mine is lighter, perhaps because I enthusiastically applied the moly grease. This is a trigger that you have to educate your finger to. The first time that you try it, you definitely want to be on target, because chances are the CFX will go off before you expect it. This trigger requires gently pulling the first stage until you feel the slight resistance of the second stage. Then, just a bit more pull, and the shot is gone. If you want a light, crisp trigger for field target competition, the GTX delivers the goods. The trigger comes with two screws that are pre-adjusted, so don't mess with them before installation. Once screw adjusts first stage pull, and other adjusts second stage creep, but I didn't find the need to play with either of them. I think the GTX trigger is an excellent modification to the Gamo CFX, an already accurate air rifle. The GTX trigger results in a very large improvement to the Gamo for less than $30, and I can heartily recommend it. With the GTX trigger installed, I think the Gamo CFX can compete nose-to-nose in field target with any from-the-factory spring piston air rifle made today, and it wouldn't surprise me to see more CFX's at the firing line with that distinctive gold trigger installed. 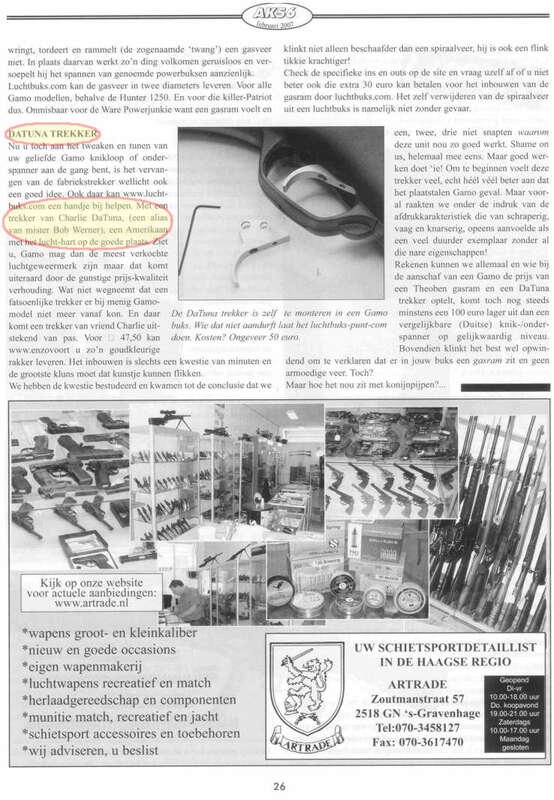 Over my short time as an airgun hobbyist I have been reading various airgun forum posts where people complain about the trigger on their Gamo air rifles. I have always read about CharlieDaTuna's GRT-III trigger blade, and the rave reviews everyone gave about this mod and how it turned their $100-$250 Gamo into a million dollar match rifle. Of course I was skeptical, but then I didn't own a Gamo and didn't know what the big deal was. A few months ago I started seeing other Gamo trigger mods, one by Peterdragin (a.k.a. Rich from Mich) and yet another by someone else, which we all know of as the 'spring, nut, and screw' mod. While wandering through Wal-Mart one night I noticed a Gamo box way up on the top shelf. It was an S1K and on clearance for $74 and bought it. I took it home, cleaned the funk off, and started shooting it. Power was nice, sights were exceptional for a sub $100 gun, spring twang wasn't too bad, but that trigger'..yuk! I quickly got on the forum and researched a little, found the different mods. I had to decide on one mod, it had to be inexpensive (not sure if I'd keep this gun), and I didn't believe in leaving loose hardware floating around in my guns, so the 'spring, nut, screw' mod wasn't even a contender, plus it was $10 from Power Stroke Pneumatics vs. $8 for Rich's trigger insert. I contacted Rich and ordered an insert. I followed Rich's directions for the trigger insert installation. I lubed, but didn't spend a whole lot of deburring time on the trigger parts as it looked pretty good out of the box. One part of Rich's trigger tune is to rebend one of the trigger springs to give a slightly heavier pull (heavier being over a pound). The reassembly took quite awhile, maybe 45 minutes, especially since I wasn't at all familiar with the Gamo trigger. Rich sent some decent pictures, and there was another on his website that helped. All in all, not too difficult a job, but then I wouldn't say everyone would want to dig into this part of the gun if they didn't have to, or if they weren't exactly organized when they take things apart. Gun back together'it was time to shoot'..more on that later''. A few weeks after I bought the first S1K from Wally World, Natchez had refurbed Hunter 220's for $79. I placed an order. It's the S1K with a wooden stock, and of course the same trigger. This time I thought I'd try something different, so I contacted Bob Werner (a.k.a. CharlieDaTuna) and placed an order for his GRT-III trigger blade. Bob was great to deal with. I took my new blade out of the bubble package Bob mailed it in to look it over. One of the first lines I read in the directions was 'in most cases there is no need to remove the trigger assembly from the gun for installation of the GRT-III'. I looked at it, strolled out to the garage, grabbed a #2 Phillips head and a small slotted screwdriver as well as my Hunter 220 and went back inside. In 6 minutes, 6'minutes I had the stock off, the GRT-III installed and the stock back on the gun'..6 minutes!!!!! I did a quick look over the instructions to see what adjustments I needed to do, 'The trigger blade has been pre-adjusted and it should be pretty close for most application. Just install it and adjust only if necessary.''sweeeeet. Later I plan to tear the 220 down for a lube tune, but for now I just wanted to feel the GRT-III 'out of the box'. Now for the comparison. The design of both mods is to make a Gamo trigger into a true two-stage trigger while reducing trigger pull and make the trigger predictable. Both triggers do this, and they both do this well. There is however a difference. Beyond the obvious price difference and the fancy gold trigger blade the actual feel of the GRT-III trigger blade is great. I don't own a trigger pull scale but I would have to say as far as trigger pull, both triggers are about the same. The GRT-III also has a first stage adjustment screw, although I didn't need to adjust it at all. The mini-trigger insert has only one screw which I only adjusted to remove slack in the trigger. The GRT-III trigger required no spring bending, and no complete disassembly of the trigger, and took 6 minutes, 6 minutes, 6 minutes. I would say that most people who don't hurt themselves 'often' with common hand tools could install the GRT-III without problems. The trigger insert took more time, required a little more fiddling, and without some mechanical know-how I would still be looking at a pile of parts. In all fairness the S1K that I installed the insert in was the very first Gamo I had apart ever and I was also doing a lube tune on this gun'so it's a bit hard to compare, but I think 6 minutes says it all. As far as air rifles go, I appreciate real wood over synthetic stocks, and I like a good feeling properly machined trigger blade over a rolled sheet metal trigger blade, and the GRT-III feels better under my trigger finger. I know there are nay-sayers out there that say it's all about light trigger pull, but I can feel the difference in the ergonomics. The serrated grooves machined into the face of the trigger blade feel good. If nothing else besides that feel and the 6 minute installation time vs. a pile of parts on my bench and me scratching my head for twice that long, I would gladly pay the price difference again and again'honestly. Even if I had someone else install these two mods for the same price difference I would pay the difference for the better ergonomic feel of the GRT-III over the stock Gamo trigger blade. I have to give kudos where kudos are due and Gamo could learn a lot from either of these two mods, they do make a nice trigger out of these very poor out of the box triggers. Crooker made a silencer for a Korean Big Bore 909, a .45 caliber air rifle. In 2004 he sold the rifle and silencer to another party and he shipped it through the U.S. Postal Service, where it was intercepted. When ATF tested the silencer on a firearm, it silenced the report. That is the legal definition of a silencer. Making a silencer is a violation of several counts of the same law. Because a silencer is considered to be a firearm by federal law, the maker has just made a firearm without a license to manufacture - count one. Firearms that are sold are required to have serial numbers, and this one didn't - count two. And possession of an unregistered silencer is also a crime - count three. For 12 years I have maintained that silencers and airguns do not mix. People who play with the law open themselves to prosecution. Even if you win your case, the experience will not be pleasant. Now that BATF has a win under their belts, I expect them to prosecute other silencer violations more vigorously. This was a jury trial. I was working on a Marksman 61 today ( AKA HW-77K) and while tearing it apart, I decided to forgo use of the spring compressor and just unscrew the endcap by hand. I've done it dozens of times and knew exactly what preload was involved with the factory spring. Well.. as I unscrewed it off the last thread, the mainspring and steel guide launched the the endcap sideways and the razor sharp edge on the factory guide tore into the top of my right thumb, incising it to the bone from just below the nail, across the top of the knuckle and about 1/3 the length of the long thumb bone. Laid that puppy right open.. bone, cartilage and vein (torn) lookin' right up at me. Oops! ( fill in your favorite blue language here). No- I did not drop the endcap. I placed it carefully on the bench, grabbed a paper towel, then went looking for the phone book for a walk in clinic that will do stitches. I didn't want to head for the ER in New Haven because you can't walk out of there without spending at least $250.. and waiting for hours. After searching the Yellow and white pages, it seems there are no longer any nearby walk in clinics that are open on Saturday afternoons... so screw it, I'll fix it myself! Right thumb is doing OK right now.. I splinted it to keep the thumb from bending and opening up again, and I taped the wound shut, but there is swelling (because of trauma and a torn vein), but it stopped my tuning activities for today at least. I think I'll invest in some Kevlar gloves. When I saw the Gamo/NRA Special Edition 1000 in "our" American Rifleman magazine I made room for one more Springer in my gun rack. I'm not so attached to the metal and wood look so I wasn't put off by the synthetic black stock. Kinda stealth looking with that covert sniper appearance that makes a guy a much better shooter, at least in his own mind. The NRA logo and serial number (one of 1000) put it a notch above the Gamo of ordinary man. My own number 000247 just does put me in the upper quarter of the class. The official NRA medallion does give the rifle status. It comes equipped with a 4 x 32 adjustable objective scope with a much appreciated scope stop to keep it where you place it on the scope rails. It will focus all the way down to 7.5 yards, for those whose long distance shooting amounts to one end of the living room to the other, all the way to infinity at the other extremes in range. Testing proved it truly could push a very light pellet to almost 1000 fps but it favored it's own Gamo Pro Magnum pellet at 8.9 grains for the highest ME of all pellet weights tested at 16.33 ft/lbs. Velocity at that power is 909 fps. Trajectory for a 1/2 inch rise and fall above and below the line of sight gives a point blank range of 43 yards. In it's role as a sporting weapon, it does well with the 4 power scope. Not so powerful that the quarry at that max range develops a personal relationship with you before the shot. Less to fool with, just aim and shoot without adjustments other than distance. The only bug, and don't we all know it, is the trigger. Not a big selling point with the beloved Gamo line. 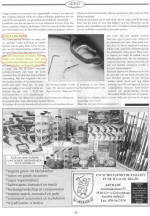 Thankfully, CharlieDaTuna (Bob Werner) has solved the Gamo's weak link with his GTX drop in trigger. With less than 30 minutes work I had a slightly more than 1 pound trigger pull that is crisp and light. I have more than a few HW's and can compare the GTX to the Record trigger and give the edge to the GTX mod. These really nice rifles are still available and, if you don't have a Gamo, this is an excellent choice. Make room on that rack for one.